The work place is seeing a revolution and ergonomically designed co-working offices are the new way to do business. Not so long ago freelancers and start-up entrepreneurs had to find the closest coffee shop with internet connection or a seedy internet café if they wanted to work amongst other people. A space that’s thoughtfully laid out, with a variety of areas to suit a range of business requirements is essential to productivity. But all that’s changed. Today, independent professionals are renting co-working offices that come with fast internet lines, meeting likeminded people and most importantly, a space that’s been developed with ergonomics in mind, transforming what might be a soulless office into a networking business haven. Be it private spaces for uninterrupted focus time, to more social spaces where you can meet and discuss ideas with others, collective work spaces provide the answer to a widespread need. An ergonomic work environment is vital to getting work done, and furniture plays an important role in achieving that. A collective that’s serious about drawing in independent professionals will choose its furniture carefully. Perhaps the most important piece of furniture is the desk which should have enough surface area to fit a variety of accessories, with space left over for that much-needed cup of coffee. While some work needs complete focus, there are often times that being able to lean over to ask someone’s opinion will help you create your best work. A good shared office will facilitate that interaction between like-minded people, and before you know it, you’ll have broadened your professional network – and potential for work. All independent professionals know that tech admin comes with the territory, but renting facilities at a collective work space will mean less time spent on those niggly tasks and more time getting your actual work done. A shared office should offer you various resources, including IT support, fast internet and even a shared assistant – hoorah! 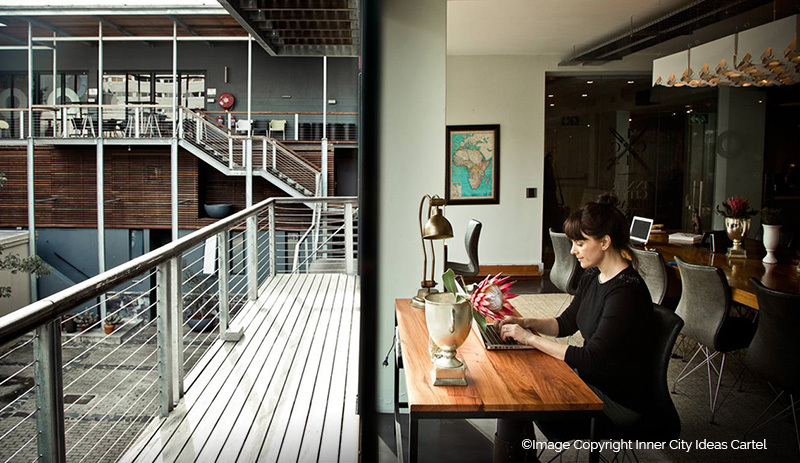 The Inner City Ideas Cartel in Cape Town is an example of a great collective work space getting it right. Its promise is to offer the resources that entrepreneurs need to create opportunity, while keeping expenses to a minimum. At Block & Chisel, we have the perfect mix of furniture to help you create a space that inspires productivity, while making you feel at home in your work space.